When I first saw the trailer for Rango, I immediately thought it was going to be another run-of-the-mill animated movie for children. Slowly, details started to trickle out and I heard about references to Fear and Loathing In Las Vegas and the Dollars Trilogy, among others. My interest was piqued, and it turns out that my initial notion was dead wrong. 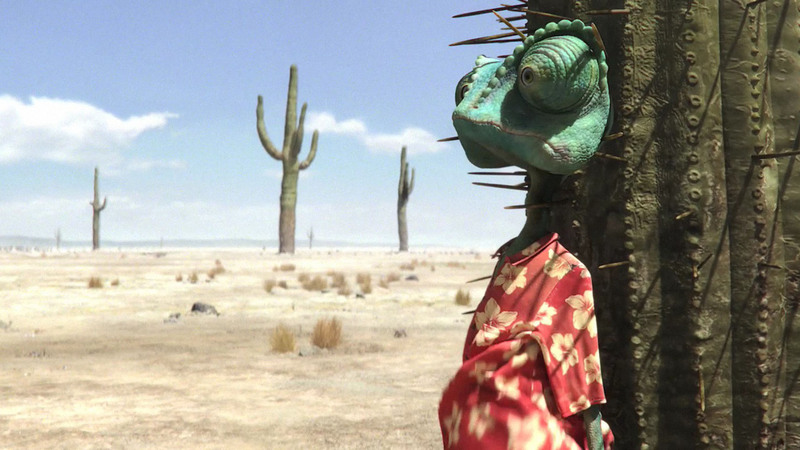 Rango is a smart movie, one that caters toward adults and film buffs. Sure, kids will love its stylish and unbelievably detailed visuals, as well as Johnny Depp’s charming rendition of the title character, but many of the film references and “adult” level jokes will go over their poor little heads. I think that’s what made Rango so appealing for me — it isn’t “dumbed down” at all. So yeah, Johnny Depp is the voice of Rango, a pet chameleon who accidentally becomes stranded in the Mojave Desert. Scared shitless by being alone amongst red-tailed hawks and other predators, Rango wanders aimlessly and eventually meets a desert iguana named Beans, who takes him into an Old West town called Dirt. It is here where the ever-imaginative chameleon develops his persona of Rango, posing as a tough outlaw who once killed all seven Jenkins brothers with one bullet. One bullet! The townsfolk eat this up, and after Rango accidentally kills a terrorizing red-tailed hawk, he is appointed as the town’s sheriff. What ultimately unveils itself is a clever homage to the classic Chinatown, with the town trying to figure out what the hell happened to their disappearing water supply. Nods to old Westerns are also frequent, and the movie itself is nothing more than an animated spoof/tribute to the genre. Not enough can be said of the movie’s visuals. This is one of the best-looking animated features I have ever seen, and it is clear that Pixar now has some competition in the form of Industrial Light & Magic. Do yourself a favor and see this on Blu-ray. It is mind-bogglingly sharp. The voice acting is also quite impressive with Johnny Depp leading the way. Whereas other big name actors have been known to phone in their performances, Depp is on top of the game here and is clearly having a great time. Ned Beatty, Bill Nighy, Abigail Breslin, Stephen Root and Harry Dean Stanton also lend their talent, to name a few, and the casting overall is quite flawless. 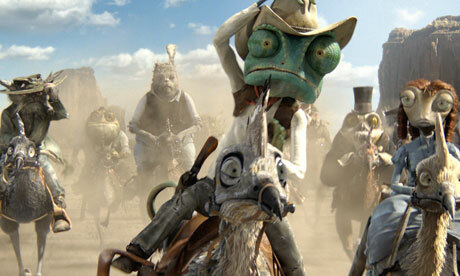 I liked Rango and its eccentricities quite a bit, particularly the beginning and end sequences. The middle portion, while entertaining, dragged on a bit too long, and the overall feature suffers a little as a result. Still, there is a lot to like here. Kids will be pleased with the characters and the stunning visuals, and adults will love all of the references and gags related to other films. A spicier middle segment would have made this one of the top films this year, but it’s still a fun way to spend two hours. I really enjoyed this film. I was worried when we watched it that it would be a bit scary and too grown up for my kids (4+6) but they enjoyed it lots too. And now I can get them singing the mariachi song by just shouting RANGO!! Hahaha that’s great. Thanks, man! Sounds neat. I’m going to buy it. Awesome. I think you’ll dig it, man. Can’t wait to see this tonight, I’ve got it from Netflix yesterday. That first photo just makes me laugh so hard, the trailer was such a hoot. Cool, looking forward to your review. 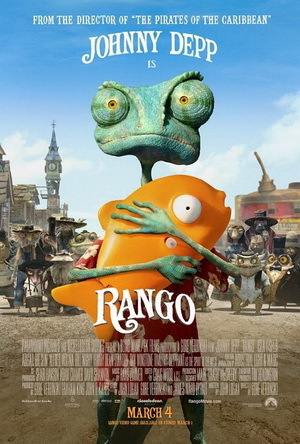 I liked the eccentricity of it but as a whole, Rango didn’t quite work for me. It seemed a bit pointless and as you said, the middle part sags and is a bit dull. It’s an acquired taste, to be sure. Sorry to hear you didn’t like it as much, Castor.